Like the faux ant near the chickens? Julio Latino ("Latin July") at [eatingclub] vancouver continues! 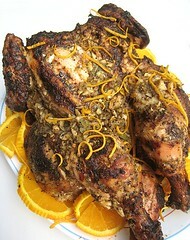 For some reason, I've been calling this "Cuban" chicken, maybe because of the orange and the lime in the marinade. The other day, when I had some time in the afternoon, I decided to go ahead and marinate some chickens for grilling in the next couple of days. I was trying to save myself some prep time. I cut out the backbone, tried to break the breast bone, and flattened the joints. 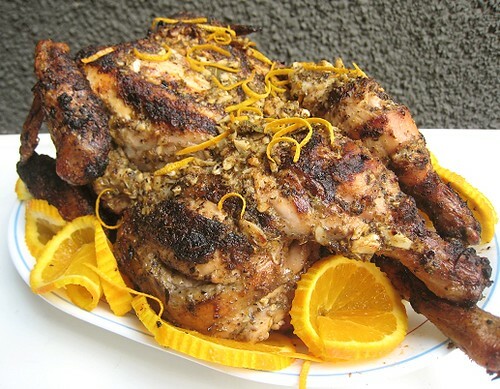 I made a marinade consisting of garlic, oregano, lime and orange zest and juices, cumin, then put the chickens in a bag with the marinade and bided my time. [ts] Chickens always look funny to me. Look at its pose! Then, two days later, all I had to do was put the chickens on the grill, cover, and wait for them to get done. On a scale of one to ten, this was a pretty relaxing day. Combine all ingredients and pour over butterflied chickens. Marinate overnight to 2 days. 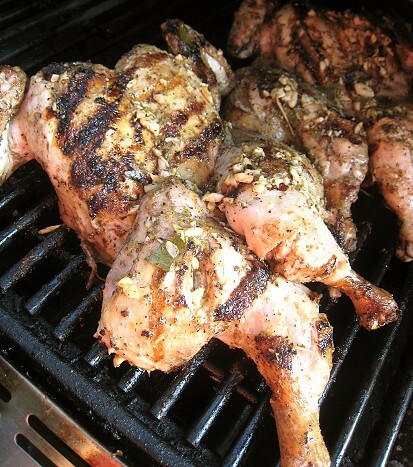 Grill chickens until done. 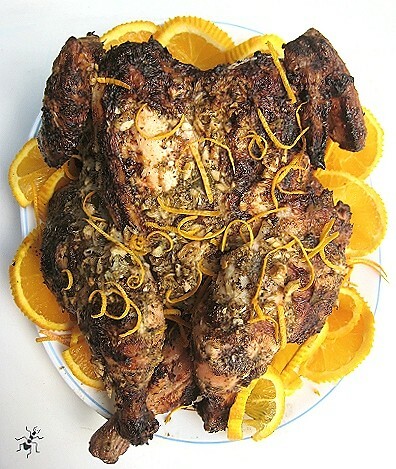 The outside of this chicken looks amazing! I suppose you could add some rum to the marinade and it even more Cuban - Mojito chicken! Your foresight is amazing--marinating for use in a couple days. I don't even know what I am doing later this evening. Love the rind and zest on the chicken! Haha... I know, it's so relaxed it's a little lopsided on the platter. That chicken looks amazing! Care to send me a piece?